The following are books we've found very useful and which might be worth seeking out for more information in particular areas. In addition to the date of first publication, where available the publisher and most recent date of U.S. publication are listed. The Fenian Cycle: stories of Finn and the Fianna. The Historical Cycle: stories of various kings said to have reigned between the 3rd century B.C. and the 8th century A.D., which fall outside the scope of GURPS Celtic Myth. Jones, Gwyn and Jones, Thomas (trans. ): The Mabinogion (J.M. Dent & Sons, 1949, rev. 1989). The version of the Mabinogion translated by Patrick Ford (University of California Press, 1977) has been recommended by others. There are lots of retellings, some good, some bad. Here are some that we found useful, either because the original source was unavailable or because these were pleasantly readable. Dillon, Myles: Early Irish Literature (University of Chicago Press, 1948). Summaries and discussion. Very readable. Fitzpatrick, Jim: The Book of Conquests (Paper Tiger, 1978) and its sequel The Silver Arm (Paper Tiger, 1991). Beautifully illustrated retellings of the Mythological Cycle. Details of armor, etc., are not always accurate but these give a better immediate feel for the heroic nature of the Tuatha than any number of scholarly works. Gregory, Lady Augusta: Gods and Fighting Men (first pub. 1904, pub. Maclean Hunter, 1976). A reasonable retelling of the Mythological Cycle and the Fenian Cycle. She has also done a retelling of the Ulster Cycle, Cuchulain of Muirtheme (1902). Rolleston, T.W. : Myths of the Celtic Race (first pub. 1913?, reissued under the title Celtic in Senate's Myths and Legends series, 1994, and in the U.S. as Celtic Myths and Legends, Dover, 1990). Excellent retellings of Irish and Welsh stories, but ignore the somewhat dotty theories on Celtic religion. Squire, Charles: Celtic Myth and Legend (first pub. 1905?, pub. Grammercy Books, 1994). 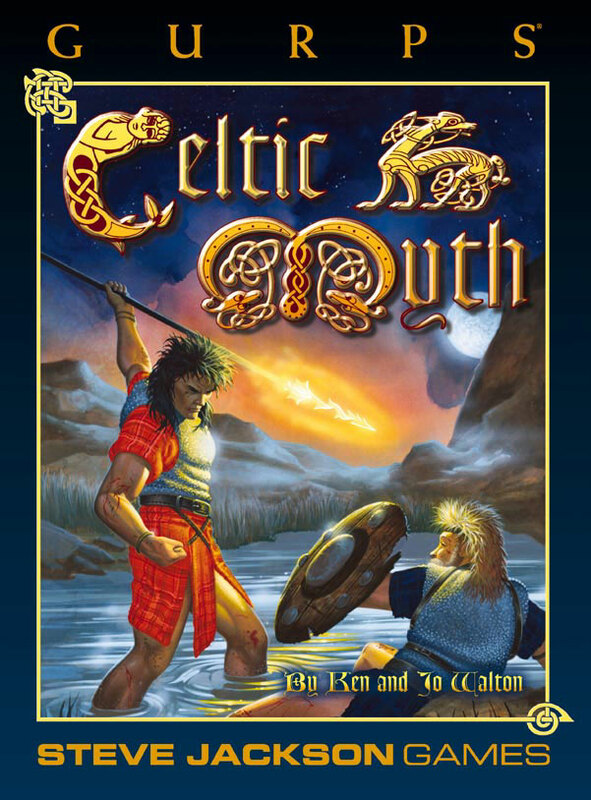 Reasonable retellings, but ignore the "facts" about the Celts. Delaney, Frank: The Celts (Little, Brown, 1989, rev. Sterling, 1991). The Enchanted World series by Time-Life Books contains many good retellings of Celtic tales, with excellent illustrations which can be used by GMs. The volumes Legends of Valor (1984) and Spells and Bindings (1985) in particular contain a lot of Celtic material. There are many books about the Celts; it seems that hardly a week goes by without a new coffee-table book about them being published. Many are inaccurate and should be avoided (particularly the "New Age" mystic genre). Below are some of the more respectable books. Any relevant books by these authors can also be considered recommended. Chadwick, Nora: The Celts (Pelican, 1970). Good for post-Roman Celts. Ellis, Peter Beresford: A Dictionary of Irish Mythology (ABC-Mythology, 1989, Oxford University Press, 1991); A Dictionary of Celtic Mythology (Constable, 1992, ABC-Clio, 1992). The first is an excellent Who's Who of Irish mythology. The second is rather hastily put together and far less reliable (the Welsh material in particular contains errors), but generally useful. Fitzgibbon, Constantine: The Irish in Ireland (W.W. Norton, 1983). A good readable survey of Irish history from the megalith builders to the present. Graves, Robert: The White Goddess (Faber, 1948, Octagon Books, 1972). Not strictly a factual book, but full of interesting speculations, and the source for this book's magic system. Graves looked at druidic riddles and tried to unravel them – a valiant effort even when he was wrong. Lynch, Michael: Scotland: A New History (Century, 1991). From earliest times to the present. Morris, Jan: The Matter of Wales (Oxford University Press, 1984). An excellently readable anecdotal Welsh history and description of contemporary Wales. Piggott, Stuart: The Druids (Thames and Hudson, 1968, Praeger, 1975). A good summing-up of the evidence on the druids (there isn't much!) but rather a drudgery to read. Ross, Ann: Everyday Life of the Pagan Celts (B.T. Batsford, 1970, Barnes & Noble Books, 1986). Ross, Ann: Pagan Celtic Britain (Routledge and Keegan Paul, 1967). Webster, Graham: The British Celts and their Gods under Rome (Batsford, 1986; U.S. title Celtic Religion in Roman Britain, Barnes & Noble Books, 1987). Scholarly evaluation of all the archaeological and epigraphic evidence for Celtic religion; a good updating of the information in Ross. The list of modern fiction dealing with the Celts is almost endless. Below are some which are likely to inspire GMs. 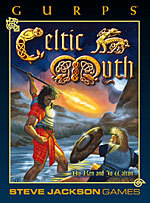 Some are "novelizations" of the old stories, others just incorporate Celtic themes and atmosphere. Broxon, Mildred Downey: Too Long a Sacrifice (Dell, 1981). Ancient Celts emerge from the Otherworld into modern Belfast. Chant, Joy: The High Kings (Bantam, 1983). Cherryh, C.J. : The Dreamstone (Daw, 1983), The Tree of Swords and Jewels (Daw, 1983), and Faery in Shadow (Ballantine, 1993). Doom-laden Celtic fantasy. Cooper, Susan: The Dark is Rising series, (Puffin, 1968-1980). Magical adventures in modern Britain, with a distinctly Celtic flavor. Consists of Over Sea, Under Stone, The Dark Is Rising, Greenwitch, The Grey King, and Silver on the Tree. de Camp, L. Sprague and Pratt, Fletcher: The Green Magician (Galaxy Publishing Corporation, 1954). The fifth (and weakest) of the Harold Shea Incomplete Enchanter stories, Shea finds himself caught up in the feud between Cuchulain and Queen Maeve. Available in The Complete Compleat Enchanter (Baen Books, 1989). Duane, Diane: A Wizard Abroad (Corgi, 1994). Wizards in modern Ireland and Celtic mythology. Garner, Alan: The Weirdstone of Brisingamen (Collins, 1966, Ballantine, 1981) and The Moon of Gomrath (Collins, 1967, Ballantine, 1981). Celtic and Saxon magic in modern Britain. Garner, Alan: The Owl Service (Collins, 1967, Dell, 1992). The Fourth Branch of the Mabinogion replayed in modern Wales. James, John: Not for All the Gold in Ireland (Cassell, 1968). Themes from the Mabinogion and the Tain in a story set in 1st-century A.D. Britain and Ireland. Very funny. Kay, Guy Gavriel: The Summer Tree and sequels (Berkley, 1986-1992). Epic fantasy with Celtic and Norse themes. Very evocative. Kerr, Katharine: Daggerspell (Ballantine, 1987) and sequels. A world where the Celts have fled from the Romans to another world, where their culture has developed for 1,000 years free of outside influences. Fascinating. Llewelyn, Morgan: On Raven's Wing. (U.S. title The Red Branch) (Morrow, 1989). The Tain novelized. Llewelyn has written a number of Celtic novels and novels of Irish history – apart from The Druids, they are all well researched and readable. MacAvoy, R.A.: The Book of Kells (Bantam, 1985). Excellent novel of Viking Ireland, bursting with roleplaying ideas. MacDonald, Ian: King of Morning, Queen of Day (Bantam, 1991). Celtic archetypes emerge in Victorian, 1950s and modern Dublin. May, Julian: The Many-Colored Land (Houghton Mifflin, 1981) and sequels. The Tuatha de Danaan as psionic aliens in Pliocene Europe. Interesting basis for cross-over campaigns (including GURPS Psionics, GURPS Ice Age, GURPS Ultra-Tech, and GURPS Time Travel). Mills, Pat & Bisley, Simon: Slaine Celtic graphic novels, very atmospheric and well researched. Moorcock, Michael: The Corum (Ace, 1987) series (particularly the second trilogy). Uses many Celtic themes and has a particularly sinister version of the Fomor. Sutcliffe, Rosemary: The High Deeds of Finn mac Cool (Dutton, 1967) and The Hound of Ulster (Dutton, 1963). Walton, Evangeline: Prince of Annwn, The Children of Llyr, The Song of Rhiannon and The Island of the Mighty (Ballantine, 1971-1975). Novelizations of the Four Branches of the Mabinogion. Especially in recent years, music with a Celtic influence has been increasingly popular. Horslips: The Tain and The Book of Invasions. Both are terrifically atmospheric and thoroughly recommended for Celtic atmosphere. The Tain is also a good retelling of the story. Stivell, Alan: The Renaissance of the Celtic Harp. Many other recordings of traditional Irish and Welsh harp music are available.